Scarves. I like them, I own far more than a girl who lives in Southern California should. I wear them for about half the year, too. They're a quick accessory, and they're nice for the cold mornings and nights we have here (cold being a relative term). I notice when other people are wearing them, especially men. 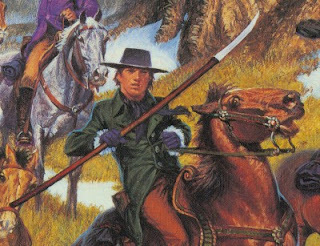 It was one of the first things that grabbed me about the Benedict Cumberbatch incarnation of Sherlock Holmes. It was attractive. Incredibly so. I tweeted about it (duh) and discovered I'm not the only fan of scarves. The next natural step was this post. Amy Pond - After Sherlock, my mind goes to the Eleventh Doctor's spunky companion when I think of scarves. Incidentally, I usually wear my scarf in the same style (well, I've been doing that since before there was an Amy Pond). Mat Cauthon - Just like most of the characters in the Wheel of Time series, Mat's been through a lot. He was hanged and nearly died, but the plus side of the unfortunate mishap is that he ended up wearing a scarf to hide the scars. Well, I guess the other plus is that he just nearly died. 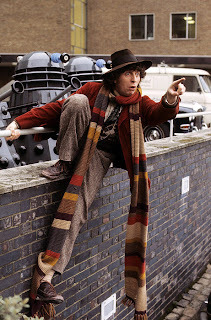 The Fourth Doctor - Not many men could wear a scarf like this and even fewer would be able to make their name stand apart from it. Tom Baker managed just fine. Stephen Maturin - The steadfast companion of Captain Jack Aubrey, Dr. Maturin was practical in almost every way. In the movie interpretation of the character (Master and Commander: The Far Side of the World), he sported a neck wrap constantly. Also, Paul Bettany. 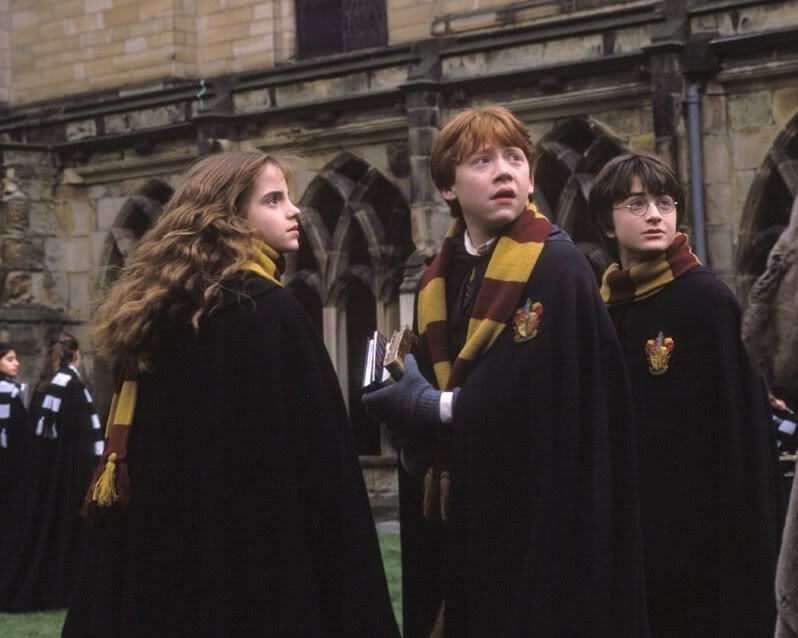 Every Student At Hogwarts - Students at the magical school have a long, cozy-looking scarf as part of their uniforms. Adults seem to wear them a lot, too. Muggles could stand to learn from this example. Last but so very far from least, Sherlock Holmes. I do not apologize if this gif mesmerizes you to the point of distraction. (via The Carnival of The Random). Let me know who I'm missing! And if you adore scarves: 25 ways to wear them. 'Twas Tom Baker who got me started with them. I asked Grandma (who could crochet at improbable speed) to whip me up one with my high school colors that nearly reached the ground on each side, if unwrapped. 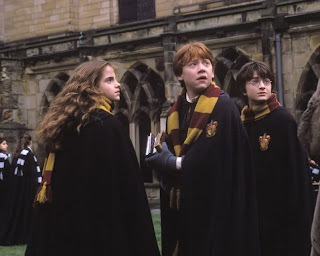 At over 6' tall and Baker-thin, with a scarf that today would make people wonder which Hogwarts house used purple and gold-yellow... Yeah, I've always been a bit odd. Today's much more simple protection against Los Angeles frost is a knit black scarf that goes fine with the leather coat. Still wear 'em. Still love 'em. 2. holy CRAP that gif! I never went through a scarf phase myself, but as a young man I had a wicked love affair with vests, thanks to Han Solo. I never went through a scarf phase myself, but they look fantastic on other people. Plus, you get to swish them off all dramatically. I only entered my scarf phase a couple years ago when I suddenly couldn't tolerate winter anymore. I live in the northeast. It's effin' cold! We get snowfalls of 2" over night when it's bad. I think I have to give this costuming choice some thought when watching my favorite shows now. I do love a man who can rock a scarf. ...And I mean that in the literal sense as well, since I married one. But, like, for other reasons too. Really. I'm with Mari, Cumberbatch has some sort of unexplainable appeal for me, and I think that gif pretty much sums it up! I love the look of scarves, but I never wear them. After reading this, I think it is a habit I need to pick up. 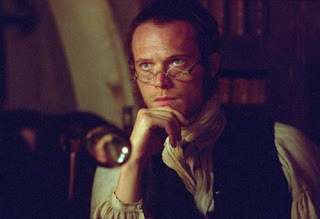 Also, Paul Bettany = Yummy. I like the design of scarves, but I in no way use them. Seeing this particular, It can be a routine I want to pick up. Cow Boy is online for you to read and love!